How do “Small” African Nations Grab the World's Attention? Moderating this panel are Janet Gunter , who contributes to Global Voices Portuguese and Julie Owono  of Cameroon. Janet talks about a panel she recently shared with Julie on technology and ICT. Such panels often have an over-representation of English speakers from Kenya, Nigeria, and South Africa. Janet and Julie have organised this panel to give an opportunity for countries with a smaller voice. Why do these countries have less of a voice? They are sometimes separated by language. Sometimes news agencies don't have it in their interest to report from these countries. Other times, historical ties of colonisation create blind spots for international media. Adérito Caldeira of @verdade  in Mozambique tells us about the 2010 bread riots in the capital of Mozambique . The government in Mozambique used to subsidise the price of bread and fuel. In August 2010, they decided to increase the prices. After this time, a viral SMS spread encouraging people to take action on the 1st of September, when the prices were expected to go up. That night, the police chief went online to discourage people from demonstrate. Some citizen media reporting tools were already in place, including an Ushahidi installation from the previous election. But citizen media also takes place offline- @Verdata publishes an offline paper which is one of the largest newspapers in the country. Early in the morning, Adérito received SMSes noting that there were tyres burning in Moputo. Soon, nobody could enter or exit the city. Commuters rushed to leave and were stuck. In a growing environment of misinformation, @Verdata was sharing breaking news. After their Internet went down, the publication shifted to Facebook and remembered their Ushahidi instance. The story was shared on globalvoicesstarted to shoot people , @Verdade continued to use Facebook and Ushahidi to point people to safe areas and direct them to food and resources. Janet asks if the Western media contacted him only after people were killed– does the Western Media just care about the body count? Adérito responds that they only got in touch after a boy was killed. One of @Verdade's reporters was at the strike, noticed that the police were using AK-47s, and watched a boy die in front of him. Were any International reporters on the ground at the time? Probably not. The BBC had a correspondent there, but that correspondent was staying close to the mainstream media, who weren't reporting the story. Sara Moreira  tells us the story of the coup in Guinea-Bissau  in April this year. This is a country in West Africa with over 1.6 million people. It was a Portuguese colony for many years and gained independence in 1974. Portuguese is the official language, but only 14% of the population speaks Portuguese. Politics in the country has proceeded in a succession of coups, especially over the last 15 years. No elected president has ever finished a mandate. Tension was high in Guinea-Bissau earlier this year, after the former president died in January. After elections in March, Global Voices reported on claims of an unfair election . Tension also rose as the Guinean military was pressuring the Angolan military to give them arms. In the days leading up to the coup, Sara was in touch with Portuguese journalists about the growing tensions. But the person who broke the news was broken by a local blogger Aly Silva  (who writes at Ditadura do Consenso ). During breaking news like the coup, Aly kept audiences updated on movements of the military as each facility was taken. The next day, he was arrested by the military . Employees from the national hospital made calls for supplies while reporting news from the ground. Two days later, during a demonstration of peace, when protesters were attacked, the hospital posted images to the Facebook group. Janet asks about the attitude of the Portuguese media, who took a very snobbish attitude towards citizen media. The day after the coup, Sara noticed on Twitter that Portuguese journalists were joking that citizen journalists were untrustworthy. When Sara pointed out that Al-Jazeera was retweeting posts by the bloggers, the Portuguese media started to pay more attention. Most of the news in Chad comes from the AFP , whose journalists in Chad are sometimes government ministers. Internet Sans Frontières is trying to find ways to empower real citizen bloggers. Julie asks why the Chadian blogosphere is so tiny. The answer is that the only people who can blog are rebels. A friend who is a blogger, now in Paris, told him that the only way to blog was to cross the frontier to a cybercafe in Cameroon. Chad is a little country, but they have a full set of Internet repression technologies: deep packet filtering and continuous crackdown on internet publishers. With 30,000 facebook users on Chad, the government can pay people to monitor what you say. One young man was arrested for his facebook page and may now be dead. Julie asks how more citizen media can be encouraged in Chad. Internet sans Frontieres tries to provide bloggers with better tools and support. Dan from Al-Jazeera Stream mentions that it's sometimes hard for journalists to engage with bloggers when they fear about the repercussions of talking to the press over the Internet. 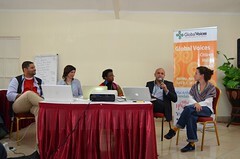 Global voices has been trying to cover Equatorial Guinea with bloggers based in Spain and Portugal who are parts of human rights associations. It's hard to find bloggers on the ground who are willing to speak up. Mozambique has three or four regular bloggers. People comment about violence, soccer, or crime. People don't comment about politics. A Nairobi-based blogger asks about the position of women in the Chadian blogosphere. There aren't many women bloggers in Chad. He has been encouraging civil society organisations to include more women. Janet points out that none of the sources referred to in this panel was a woman. Another participant asks about success stories of reaching international audiences with positive stories. Gabon has 1 million inhabitants with a 9% Internet penetration rate and 150 bloggers. Julie tells us the story of protests in Gabon at the same time as the African Cup of Nations. Since the wire agencies were reporting on the football, people couldn't find out about it. After Global Voices started a special subject page on unrest in Gabon , the protests received International coverage. Jean-Miguel, who writes for Global Voices in Portuguese, talks about how Egyptian bloggers mentioned in posts were sometimes killed or detained last year. How should writers go about mentioning people in our posts? Should we call them first, how do we reach them if the government is monitored? Julie tells a story from Cote d'ivoire. During the crisis in 2011 , they would always ask people before proceeding to quote people in a post. Eventually he had to flee to Nairobi. This can take up to days, but it's incredibly important. In Guinea Bissau, Sara always checks with people before citing them. Victor, from Malawi, suggests that we reach out to international journalists and diaspora celebrities to highlight issues within a given country. Julie reminds us that there will be a session tomorrow focused on building a network of African bloggers.